September | 2011 | R.O.T. DPS is not and never was part of the ‘holy trinity’. This is incorrect because DPS is still an outsider due to massive popularity over the Tank and Heals roles. The Holy Trinity meant that if you played this class you would get groups quickly. In fact, having one was a beacon for the other two. I can remember days where if you were looking for a healer, the healer would ask if you had a tank or Enchanter (really, it was just the Enchanter class in EQ, later also the Beastmaster somewhat) and if you didn’t, they’d pass or ask you to tell them if you did get one. Now people use it to describe the three critical roles or foundation roles in a MMO: Tank, Heals and DPS. Still isn’t anything Holy in DPS – it’s needed but there are so many of you (us) that you’re pennies in someone’s pocket. Posted in EverQuest, MMOs, Random Ogre Thoughts, World of Warcraft. 1. I already pre-ordered – they should know that. 2. I didn’t get any beta invite email? I double checked spam and trash folders, only thing in them (trash) is the release date announcement. Posted in MMOs, Random Ogre Thoughts, SW:ToR. [RIFT] Mage is the New Rogue! I’m talking about Rift, you can stop reading now. Apparently patch 1.5 hit last night (I was sleeping – went to bed at 7:30pm) and Trion swung the pendulum that is class balance towards rogues. To be fair, it’s more like each class has their own pendulum and you swing between being “over powered” and “victim”. Right now the Rogue pendulum is in the OP side with the Warriors and Clerics (somewhat behind them) while the Mage is sitting in the middle of OP and Victim. If everyone else is into the OP side of the swing except Mages, then the Mages are thereby the new Victim. This was confirmed by my co-worker coming over and QQing at me about how Rogues are now smoking him despite his T6 PVP gear and he doesn’t stand much of a chance. Warriors got slight nerfs though some specs weren’t impacted at all and they’re still somewhat monstrous in PVP. Clerics didn’t get too many changes from what I understand – at least nothing ground breaking. Mages got some nerfs but not a ton from what I hear. They’re mostly the new target to get your, “I just killed someone,” buff from. Why do I suddenly want to roll a Mage? Posted in MMOs, Random Ogre Thoughts, Rift. I was looking at a desktop wallpaper that showed the opening part to the “Hope” cinematic and I automatically picked out the classes available in that wallpaper. No wait, that’s not a Trooper since it’s Sith side and Troopers are only Republic side. So who is the Trooper for the Sith? That lead to thinking about the parallels in the classes. Sith Inquisitor = Jedi Consular = caster type, Force focused characters. Sith Warrior = Jedi Knight = melee type, Force focused characters. Bounty Hunter = Smuggler… no wait, Trooper = ranged, armor type with some tricks, gadgets and rocket packs… no. Not exactly. About the only thing they seem to have in common is the heavier armor and ranged capabilities. Imperial Agent = Smuggler = ranged and light armor, sneaky types. Kinda. It’s easier to draw multiple parallels with the Jedi/Sith but not so much with the other classes which made me wonder why they went this route? Isn’t it possible a Bounty Hunter could work for the Republic? A smuggler for the Sith? And Troopers – don’t both sides have Troopers? And why wouldn’t they also have Agents? Ultimately Jedi and Sith are the same, they just use the Force differently. So why didn’t they go with all these classes being available to either side? As with most d20 System games, Star Wars offers playable races (called species) and classes to the Player Characters (PCs). The character classes are Fringer, Noble, Scoundrel, Soldier, Force Adept, Jedi Guardian, Jedi Consular, and Tech Specialist (added with the Revised Edition). Prestige classes allow advanced characters who wish to specialize in certain suites of abilities to join a class devoted to them. For example, Jedi with special talents at helping others can choose to specialize as a Jedi Healer, while a blaster-wielding mercenary might earn a reputation as a Bounty Hunter. The core rulebook includes the Jedi Master, Jedi Ace, Crime lord, Elite Trooper, Starship Ace, Officer, Darkside Marauder, and Darkside Devotee. Supplements to the core rulebook introduce many more prestige classes. Saga edition changed things around and made Force Adept a prestige class. It (effectively) has base classes that evolve into one side or the other. So why not have base classes and then a choice of which side to work for? I suppose there might be some option for a Bounty Hunter to work for the good side at some point and you might suggest Bounty Hunters (as they are in Star Wars – I still love you Dog!) aren’t the kind of people you’d employ as a ‘good guy’. In the end, it’s likely easier to tell a story if you know where the player is coming from so you have limited starting options and factions. Right now they have to work with eight stories where as if they let you choose a side, they’d need to work on 12 stories (they already have the parallel for the Force Melee and Force Caster classes). Maybe that was in their plan but they had to shelve it because of deadlines? Still… why’d the good guys get saddled with the Trooper? 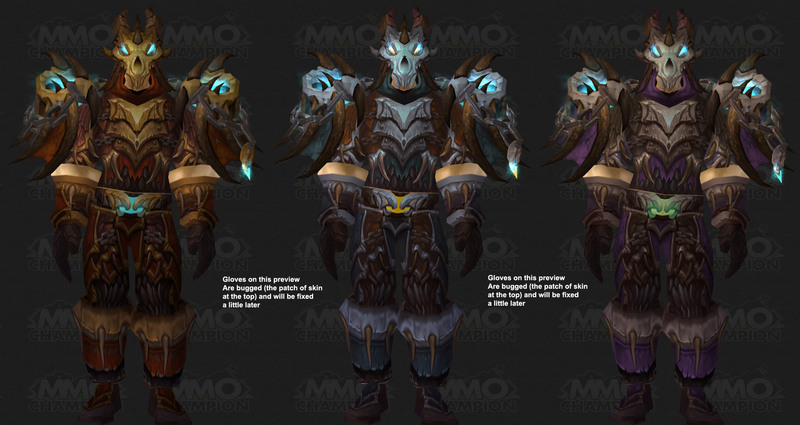 Hunter T13 armor sets were data-mined yesterday and I’m not sure how I feel about them. First off the picture available is bugged (we hope) with the gloves top edge being tan skin texture. Warriors get to wear Deathwing’s jaw and we’re stuck with some blue glowey dragon skull (it is a dragon right?) helmet and shoulder armor. I dunno. I think someone’s wife is now playing a Warrior, especially given that my Trueshot Aura is now going to benefit melees more than it’s going to benefit me (20% bonus to melee but only 10% bonus to ranged – wtf?). I’m likely going to switch to Beastmastery or maybe put a point somewhere else. Posted in MMOs, World of Warcraft. I’m not going to race for the end game. I’m going to sit back and just play the game for fun. And I’m going to have a bunch of alts. Nothing new there except that a lot of them are probably not going to go very far. Unlike in WoW where I have three level 85s, two more in the 80s and another one on the edge of hitting WotLK range. 1. See the various class content. 3. One for playing with the LBO. 4. One for playing with the LLO (most likely). 5. One for playing with other family. 6. A bunch of others because I’m going to be hard pressed to settle on one for myself. Talking to points two and six; I’m undecided as to which class I want to play. I suppose the first thing I need to decide is Republic or Sith? Given my history of completing games as ‘goodly’ types, I suspect I’ll end up going Republic. I always try to play evil or mean sides in RPGs but I can’t sustain it. I usually lose interest, though I am hoping there will be some tougher choices in SW:ToR. Going Republic means one of the following: Trooper, Smuggler, Jedi Knight or Jedi Consular. Trooper isn’t overly interesting to me with one exception being the armor. I love the look of the armor, but I’m not sure about the whole Trooper thing because they’ve often been the disposable heroes of Star Wars – sort of like the red-shirt guys in the landing parties from Star Trek. Some of the guns might be neat, but I’m not sure. I think subconsciously I’m tying the Trooper to the characters I played in Tabula Rasa and I didn’t really enjoy that gameplay. I’ll likely try it, but this is the least interesting (for me) on the list of Republic options. Smuggler is one that really appeals to me for some reason. I like the pistols and roguish nature of it. I guess I like the freedom of it as well. I can be a cocky braggart without being a complete douche. Gameplay looks like it could be amusing and I do like the ship. I think this, being a ranged skirmishing class, might feel closer to my beloved Hunter class in WoW. I think I’ll play this one on my own. Playing a Jedi is a must at some point and I suspect I’ll end up playing a Consular with the kids and maybe a Knight with other family members. I haven’t done a lot of reading up on the classes yet but it seems the Consular will be more caster-like while the Knight will be more in your face, chopping your hand off type of guy. I’ll go that route when I know my gaming partners won’t be upset that I’m killing all the ‘bad guys’. When playing with the boys, I’ll have the Consular which could also be a capable healer so I’ll run it as a support type. I am aware that other classes can heal and I might go that route if it seems interesting, I just have these concepts in my head. I asked the LBO which side he’d want to play on and he said the ‘good guys’ which surprises me because he likes playing Horde side and doesn’t shy away from playing the ‘bad guys’ in other games (i.e. in Lego Batman, the Joker was his favorite while in Lego Harry Potter he preferred Lord Voldemort – yes, I was worried). I haven’t asked the LLO which side he’d play as just yet, but I think he might lean towards the Sith. The Dark Side of the Force is strong in that one! When playing Lego Star Wars he was a big fan of Darth Maul, Count Dooku, Darth Vader and the Emperor. I’m suspect I’ll nudge him towards playing the Jedi because I’m not sure how ‘mature’ a game this is going to be just yet. At some point I will have to try the Sith out and it may be that I go that route with other family that will be playing. For now, I’m going to focus on the Republic side.